Daniel had fond memories of his grandmother’s baked beans – but every time he had tried baked beans from a can or a restaurant, he was disappointed. A wife has two options when faced with such a problem. 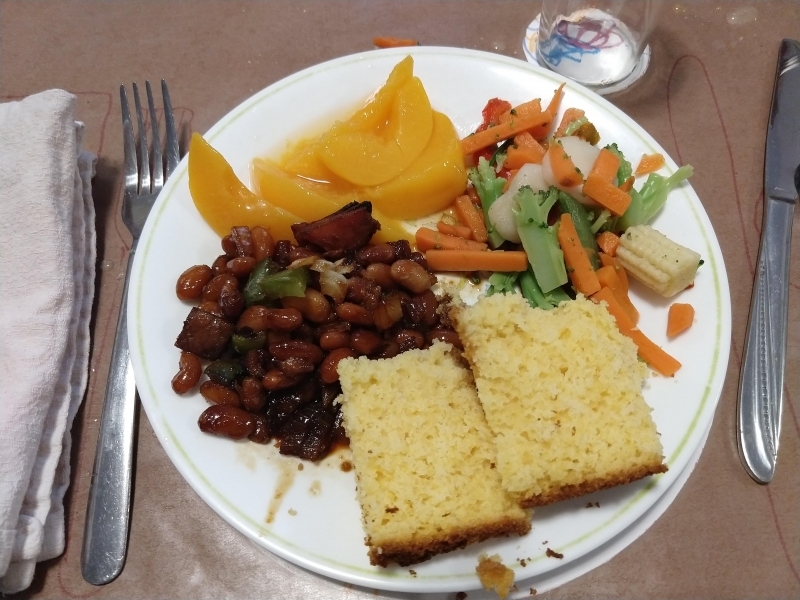 She can see it as a challenge and set out to make some baked beans her husband will love – or she can assume she can never win and just opt to not make baked beans. Until February of 2015 when I decided to cook my way through Farmer Boy for Barbara’s Laura Ingalls Wilder Reading Challenge. 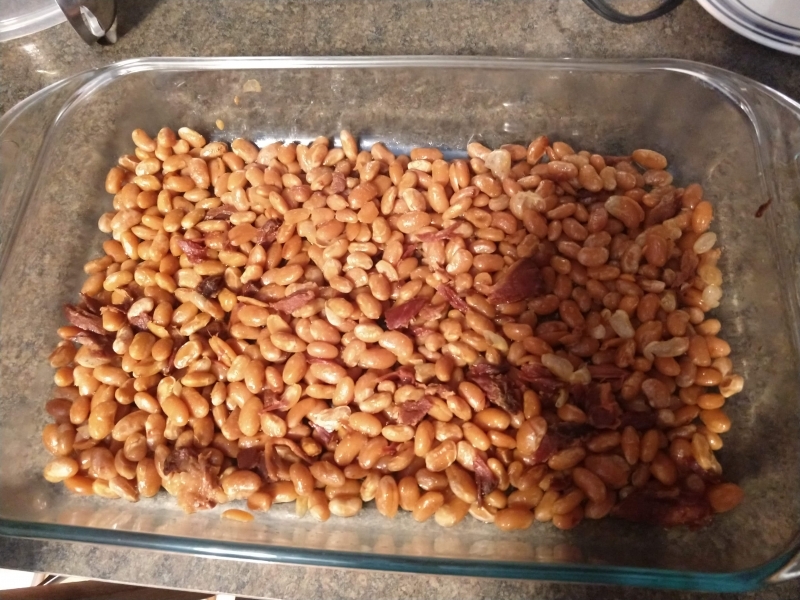 I made baked beans using Mother Wilder’s technique – and Daniel liked them quite a lot. Since then, with only a few modifications, I’ve been making them almost every month. 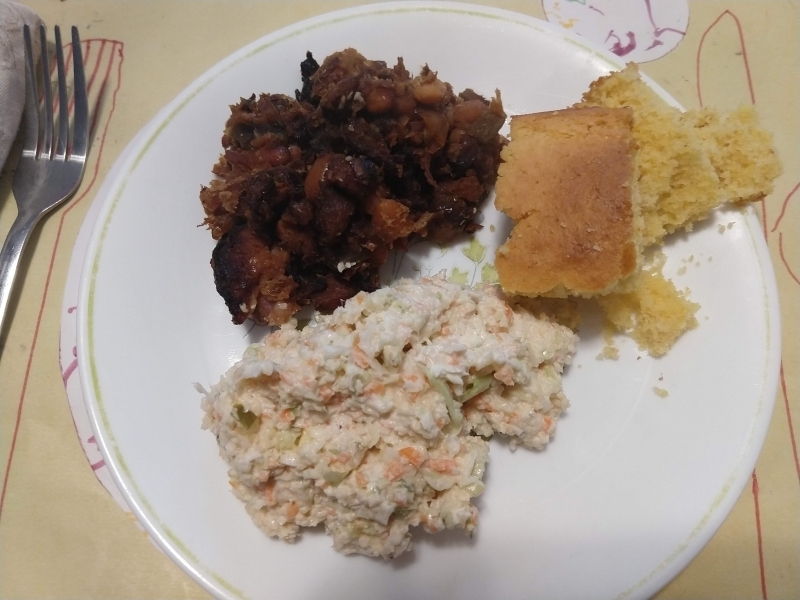 “In the pantry Mother was filling the six-quart pan with boiled beans, putting in onions and peppers and the piece of fat pork, and pouring scrolls of molasses over all. Then Almanzo saw her open the flour barrels. She flung rye flour and cornmeal into the big yellow crock, and stirred in milk and eggs and things, and poured the big baking-pan full of the yellow-gray rye’n’injun dough. 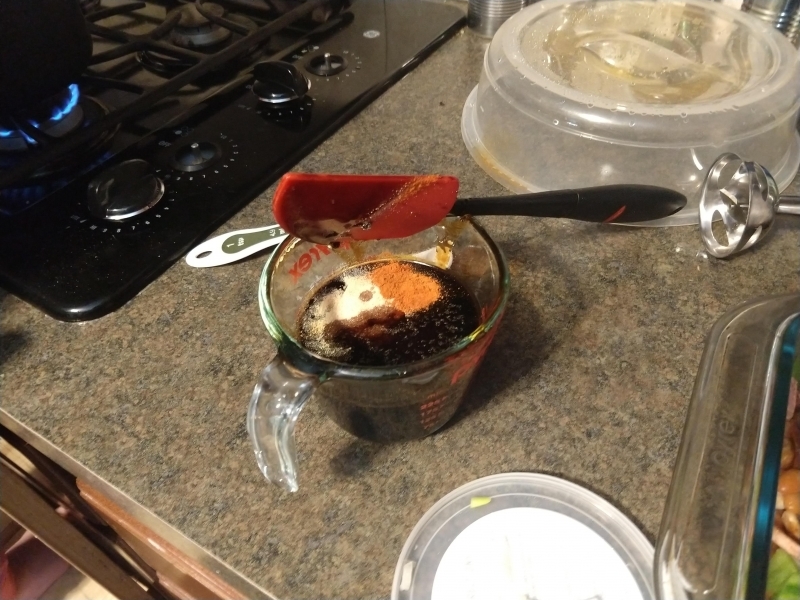 Mix together molasses, garlic powder, cayenne pepper, and liquid smoke in a 1 cup liquid measure. Pour mixture over beans. Give one more good mix. Bake at 350 (or 400 if that’s what your cornbread needs!) 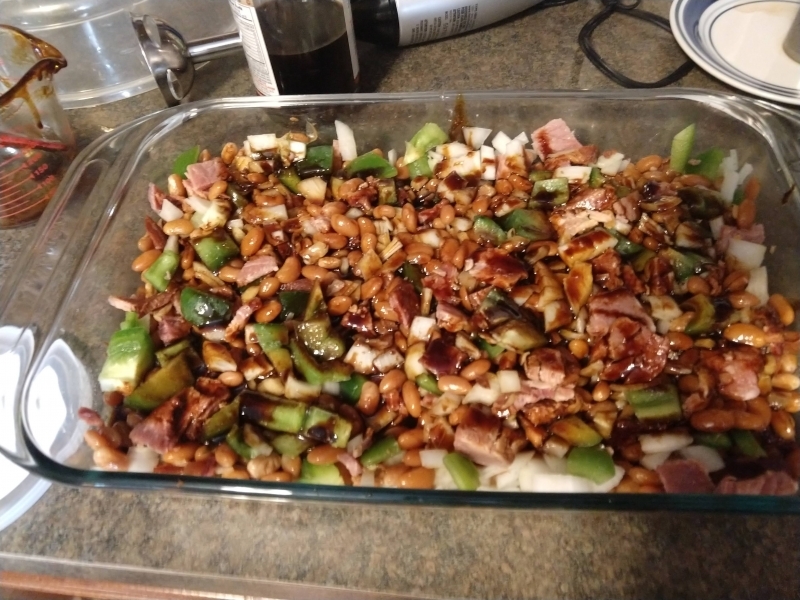 for 30-45 minutes or until just a bit crispy on top. Serve and enjoy! When Daniel and I were first married, he affronted my frugality by declaring that he preferred refrigerator case ranch dressing to the off-brand off-the-shelf stuff I had been used to purchasing. 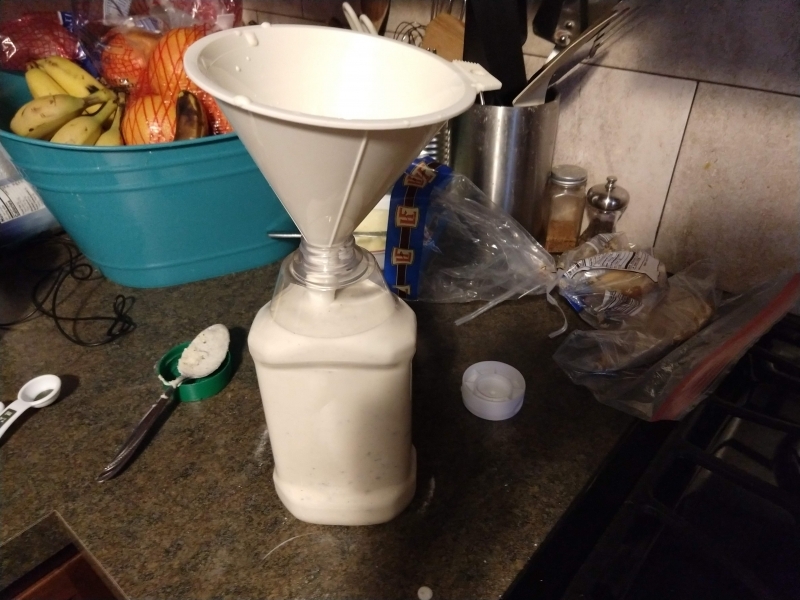 So I began a quest to make a cheaper refrigerator case ranch dressing – that would still not be too much work. 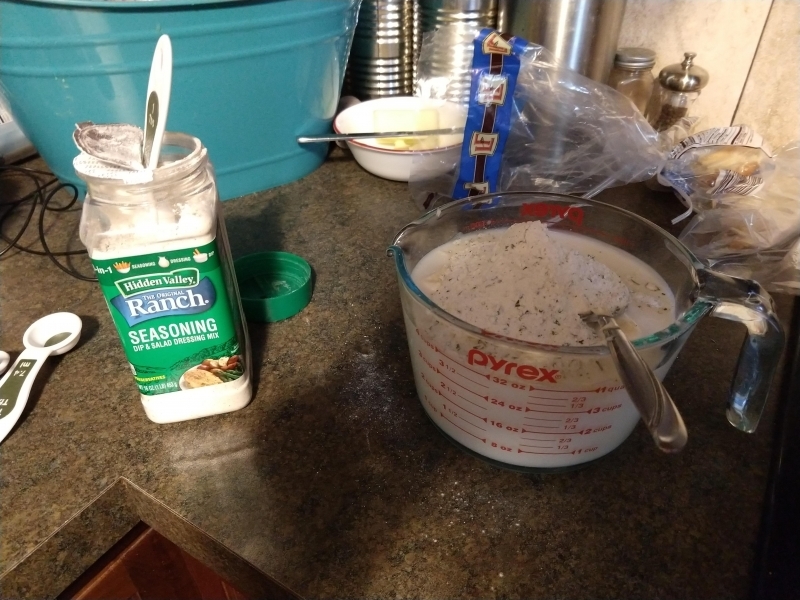 Pour 2.5 cups buttermilk in a 4-cup liquid measuring cup. Add mayonnaise to make 4 cups (that’d be 1.5 cups if you’re counting). Add 6 tablespoons of Hidden Valley Ranch dressing mix. Whisk together until smooth and then pour through a funnel into a 40 oz ketchup bottle. Refrigerate and use as desired. 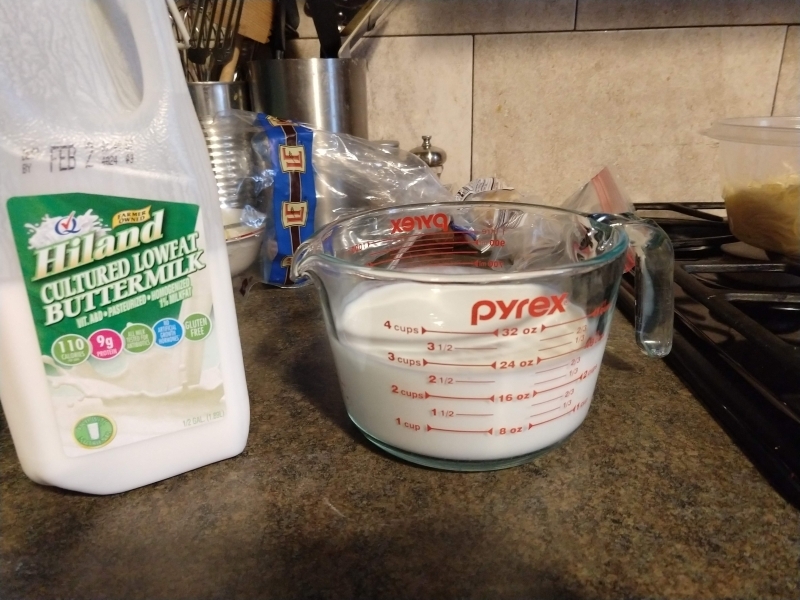 Pour buttermilk into 4-cup liquid measuring cup. 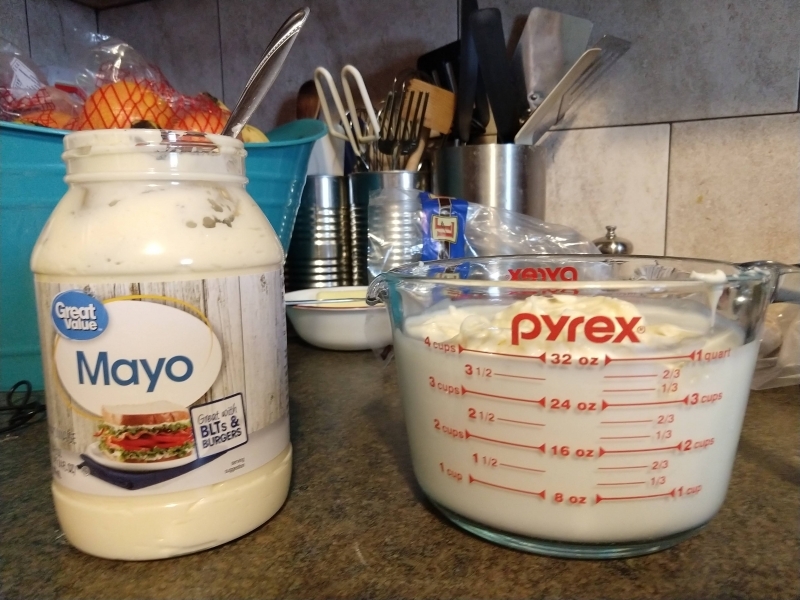 Add mayonnaise to make 4 cups. Prices listed are non-sale prices at my cheapest stores (Walmart for the buttermilk and mayo, Sam’s Club for the ranch dressing mix.) Ranch dressing mix frequently is eligible for “Instant Savings” at Sam’s Club, so my usual price is even lower. My entire recipe costs $2.59 for a little over 32 ounce – or $0.08/oz. Marzetti costs $4.98 at Walmart for a 24 ounce jar ($0.21/oz). Great Value brand non-refrigerated dressing (which is vastly inferior in taste) costs $0.06/oz. So I consider this quick recipe to be a real deal!